State pension costs drop slightly in the new fiscal year under CalPERS rates set yesterday, a short break before a new full-funding policy adopted in April is expected to boost costs nearly 50 percent during the next seven years. The state payment to CalPERS in the fiscal year beginning July 1, $3.9 billion, is about $8 million less than the current annual payment, “budget dust” to use an old Capitol term for an amount dwarfed by a large expenditure. Most of the decrease is attributed to increased employee pension contributions under Gov. Brown’s pension reform, lower-than-expected salary growth and a reduction in total payroll. The new state budget is said to give CalPERS $63.1 million for the savings from higher employee contributions, making the net reduction in state pension costs next fiscal year $8.2 million. Pension costs paid by schools for non-teaching employees, $1.2 billion, also drop slightly under new rates set yesterday, down $31.5 million. Salary increases and overall payroll growth were less than expected. The new state and schools rates are a small increase from the current year. But the cost of the higher rates is offset by reduced pension obligations from the lower-than-expected salaries and payroll (and higher employee contributions for some state workers). 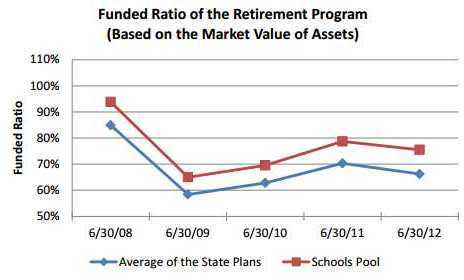 The staff report showing CalPERS will receive less money next year also shows that the state and schools funding level dropped last year, breaking a rebound after huge investment losses in the recession and stock market crash five years ago. Last fiscal year, the total state funding level dropped to 66.1 percent of the projected assets needed to cover future pension costs, down from 70.3 percent the previous year because investment earnings missed the 7.5 percent earnings target. That’s still above the low point, a funding level of 58.4 percent in June 2009. But pension officials, who have a duty to protect retirement benefits, can worry when funding levels are on a downward path or make little progress toward funding goals. A new actuarial method adopted by the CalPERS board in April will phase in rate increases aimed at reaching full funding in 30 years. But rate increases under the new method are not scheduled to begin until 2015. As the economy improves, the new policy reverses a CalPERS attempt to keep rates low during hard times. If pension costs soar while state and local governments struggle with budget cuts, there could be a political backlash. The CalPERS attempt to avoid “rate shock” by keeping rates low led to several verbal clashes with former Gov. Arnold Schwarzenegger and a budget conflict with Brown. In the spring of 2005 Schwarzenegger briefly backed a proposed ballot measure that would give new state and local government hires a 401(k)-style individual investment plan rather than a pension. That’s when CalPERS announced a radical 15-year period for “smoothing” investment gains and losses, well beyond the three to five years used by most public pension systems. In March 2009 the CalPERS investment fund dropped to about $160 billion, a deep plunge from a peak of about $260 billion in the fall of 2007. The fund is now back to about $260 billion. Schwarzenegger urged a $1.2 billion increase in the state contribution of $3.3 billion to get to an 80 percent funding level. His critics said he wanted to build support for an unsuccessful attempt to put a pension reform initiative on the 2010 ballot. CalPERS approved a plan in 2009 to pay off a $24 billion loss the previous year with a contribution increase phased in over three years. The debt would be paid off in 30 years, not with the usual “rolling” amortization that refinances CalPERS debt. When CalPERS lowered its earnings forecast from 7.75 percent a year to 7.5 percent last year, unions urged that the resulting increase in rates be phased in, presumably leaving $149 million available to avoid pay cuts. The CalPERS board voted 9-to-2 to pay a third of the increase with a rate increase in the current fiscal year and the rest over the next 19 years. Brown disagreed and put the full increase in the current state budget. “Your vote today to institute a phase-in period reinforces the same practice of prior years — to not pay our pension bills when due,” Brown said in a letter to the CalPERS board. A lengthy CalPERS process could lead to the adoption of a lower earnings forecast next February, pushing rates even higher than is already expected under the new actuarial method. The goal is to make risk a factor, reducing the chance of another massive investment loss, as CalPERS prepares for a once every three-years look in November at its crucial “asset allocation“ among stocks, bonds and other types of investments. New “capital market assumptions” adopted by the board this week expect a 2.76 percent return on fixed-income investments like bonds, down sharply from 4.5 percent expected in 2010. The new assumption for a much smaller class of inflation-linked investments is 2.95 percent, down from 6 percent three years ago. In an early conflict, state Controller John Chiang’s representative on the CalPERS board, Terry McGuire, pushed for a look at whether a shift to shorter-term bonds would improve yields if interest rates rise. Staff argued that longer-term bonds are part of a carefully planned policy intended to reduce losses if the stock market plunges again. The staff was instructed to discuss the issue with McGuire and other board members. This entry was posted on June 20, 2013 at 8:08 am and is filed under CalPERS, Rates. You can follow any responses to this entry through the RSS 2.0 feed. You can skip to the end and leave a response. Pinging is currently not allowed. Interesting. That 66.1% is CalPERS “official” funding ratio. Under Moody’s new approach (staring this July) to evaluate the creditworthiness of States & cities, their Pension obligations are going to be valued more conservatively (closer to the methodology that the US Gov’t REQUIRES of Private Sector Plans). To put that in perspective, when the funding ratio for a Private Sector Plans drops below 60%, it is consider SO POOR that the Plan is REQUIRED under Gov’t regulations to freeze further Plan accruals. Moody’s lost their credibility when they rated all sorts of Wall Street junk (CDOs, SIVs, etc) highly and then most of them defaulted. Which is not to say the CA pension systems are run well; the pension managers (pushed by the unions and approved by the officials duly elected by the voters) raised payouts higher than was safe, given the contributions. Now the pension managers are hyperventilating due the their prior poor judgement. Maybe the world securities markets will recover, maybe they won’t. Nobody knows. Either the hard work and good policies throughout the world will pay off these pension shortfalls, or not. It doesn’t matter even if the Markets recover. Public Sector pensions are grossly excessive by any and all metrics. There is simply ZERO justification for CONTINUING to allow pension accruals for FUTURE service are a rate far greater than necessary or justified. If these excessive Public Sector Pension Plans can’t be frozen (the BEST solution to the financial mess we are in), then the Future Service accrual rate should be reduced by at least 50% …. and it would STILL be greater than the vast majority of the Pensions afforded Private Sector taxpayers by their employers. You know the justification well, TL: duly elected officials approved contracts guaranteeing the pension payouts. Somewhere in the US constitution there is some language about States not being able to impair contracts. Of course a City or a County can go into bankruptcy, like Detroit or Orange County or Stockton, and alter their contracts. But a US State is sovereign, and can only evade it contracts by sovereign default. It has happened in US history. That is the only practical way to freeze or reduce any pension payout or accrual, unless there is a collective bargaining negotiation. If the world securities markets recover, no-one will have to worry much. If they don’t, my prediction is Sovereign Default. (1) Duly elected officials that colluded with the Public Sector Unions (trading favorable votes on these grossly excessive pensions in exchange for campaign contributions and elections support) and betraying their primary obligation to look out for Taxpayer (not employee) interests. (2) Yes, there is language in the Constitution about betraying contracts, but that language presupposes that those contracts were fairly negotiated with each side appropriately looking out for their sides interests. Who was looking out for the Taxpayers ? (3) Yes, Cities can go bankrupt and alter contracts, but why should reform …. meaning very material (50+%) immediate reductions in the pension accrual rate for FUTURE Service of CURRENT workers …. which is so CLEARLY justified and necessary be dependent on a bankruptcy. With such reductions (for FUTURE Service) both Legal and Routine in Private Sector Plans, what make Public Sector workers so “special” that they deserve a better deal and and better protections on the Taxpayers’ Dime ? If fact, MAKING that necessary change might enable cities in distress to work out their problems w/o having to file for bankruptcy. (4) Sovereign default is the last resort. Other justifiable and necessary tools should be available to Cities and towns (as I described in (3) above) w/o having to first file for bankruptcy. (5) Even if the equity markets “recover” we STILL cannot afford the grossly excessive pensions and retiree healthcare benefits promised Public Sector workers ,…. pensions that are growing every day, digging the hole we are in even deeper. Making no less in cash pay than their Private Sector counterparts, (and with equal Public and Private Sector “Total Compensation” the appropriate goal) there is ZERO justification for ANY better Public Sector pensions or benefits,let alone ones that are multiples greater as is the structure today.